What Basin is Right For Your Design? When designing a bathroom you want to ensure that everything blends in together offering you an elegant and sophisticated space. You’ve probably paid careful attention to your bath or shower and now it’s time to find the perfect basin to complement the space. The advantage with modern bathroom basins is that you don’t have to go with the full pedestal design that was the only choice years ago. There are semi pedestals and those that use bottle traps as a welcome alternative, helping you find the perfect basin to match your modern bathroom design. When it comes to basins for the bathroom there is some considerations that you need to think about, firstly is the size. A large basin in a small cloakroom will look out of place, as you can well imagine, you need to find a basin that maximises the bathroom space, doesn’t look out of place and compliments the space rather than destroying your design. Then there is the shape. Modern bathroom basins come in a selection of shapes for you to choose from, making it even easier to find that perfect match that blends in with all your other fixtures and fittings. I have my favourites when it comes to the modern bathroom basins available and one of them is the Qube design, these basins are large and a welcome addition to a spacious bathroom is a stylish rectangular design. Qube also took the compact cloakroom into consideration making the Qube Cloakroom basin which remains modern and stylish but on a much smaller scale. 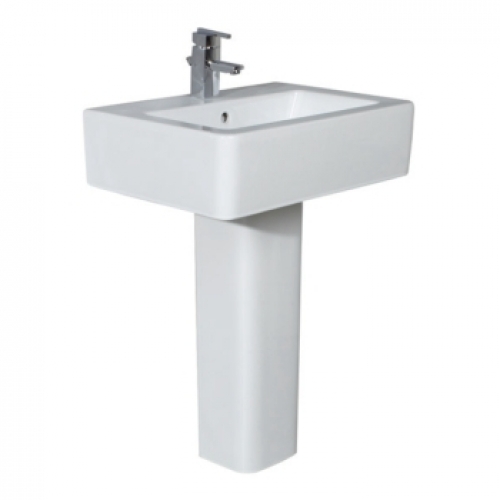 This medium sized basin is rectangular with straight edges and the tap fits to the side rather than the back, this helps you maximise the space especially when working with a rectangular cloakroom where space is very limited. The Emma modern bathroom basins are stylish and elegant in a stunning semi circular design, perfect if you have chosen a rounded edged bath or a quadrant shower tray which already incorporates that stunning curve design. The Mia Round is an ultra modern design suitable for medium to large bathrooms, these modern bathroom basins are rectangular with a rounded edge, enabling you to incorporate some curves into your modern design. Lastly are the Pensato modern bathroom basins, these are very stylish basins that are suitable for any sized bathroom. The stylish rectangular design makes them a firm favourite in any bathroom design.